Having lived out of a suitcase for the last four years, I have saved all my money for practical things like rent and plane tickets back to Paris. But I must admit that my soap, water, and red lipstick regime has served me well through these minimal post-graduate years. But now that I am a madame (no, not THAT kind), having officially unpacked my bags in Paris for good, I have finally indulged in the grownup luxury of skincare. Much like mastering that blown-out bedhead or the masterful undone/done approach to dress à la française, my eyes and pores have opened up to the transformative lure of French beauty. Over the summer, mon mari and I were invited to the bar mitzvah of 2012, a splashy, baby blue, four-day event in Monaco. It was also my official unveiling to my new extended family. How did a shiksa girl from Chicago even keep up ? My mother in-law quickly equipped me with makeup removers, eyecreams, moisturizers, and her own personal makeup bag to prep me for the event. Although I resembled an opera singer more than myself at the bar mitzvah, my favorite drugstore red lipstick could not suffice on its own. There was so much more to this ritual of getting ready. « Geez, what’s wrong with me ? » was followed by « maybe I should try this for myself ? » Nevertheless, I was once again confirmed that I will never be as glamorous as my 70-something French mother-in-law. But recently, on a mundane trip to the parapharmacie to pick up my favorite French oat milk soap, I was quickly asked if i needed help by an unusually friendly parapharmacist. Since the bar mitzvah, I have made a mental note to invest in a beauty regime. But in the matter of moments, this parapharmacist was the French bff I have been in the market for years. She was everything a best friend should be. She spoke the truth. She shockingly revealed that I have combination skin. (The horror!) She was empathetic. A fellow chronic smiler, she had a handful of answers and a basket full of cremes for my condition. She was inquisitive. « What kind of night creme do you use?», she inquired during our getting-to-know-you diagnostic. «Oh, you know. It’s blue and it has got some kind of pharmaceutically aquatic name?» I lied, hoping she did not see the Nivea hand creme on my cheeks. Frightening me with the threat of water on the skin, she had me filling up a frequent flier card in no time. Although my pocketbook can not maintain this fair-weather friendship, I am forever thankful for this parapharmacist and its resulting “a-ha!” moment. My life pre-beauty regime and now is like night and day creme. Coffee is no longer the first thing on my mind in the morning. It is most certainly my luxurious routine. I ceremoniously layer each one on, one after the other. With my fully-lubed mug, I am now one of the sticky-faced women I exchange the bises with at vernissages. It must be the goji berries. In my mind, no home is complete without garlic and anchovies sizzling away somewhere in a frying pan. However, despite the absolute obsession France has for food, cooking odors are considered an unappetizing after effect. Having cooked for several French families, I was always scolded for cooking garlic and carefully instructed to close all doors leading to the kitchen. 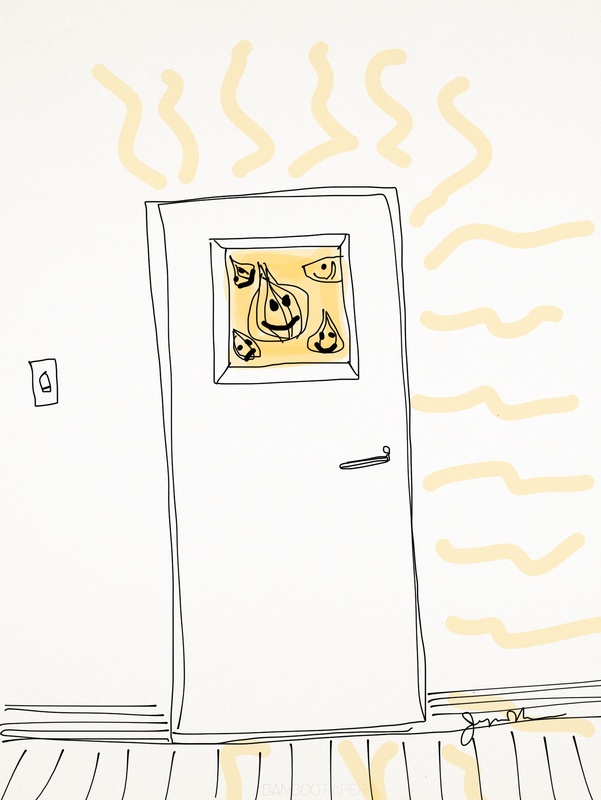 Even when we were renovating our apartment, our contractor insisted we put a door on the kitchen to block off any second-hand fumes. It is no wonder mon mari disapproved of the cinnamon stick caramel apple candles my mother recently sent in a care package. Figure-toi. His: Magret de canard (duck breast), creme fraiche, quince jelly, hollandaise sauce, bacon, cookies, cheese, San Pellegrino, plastic bag. 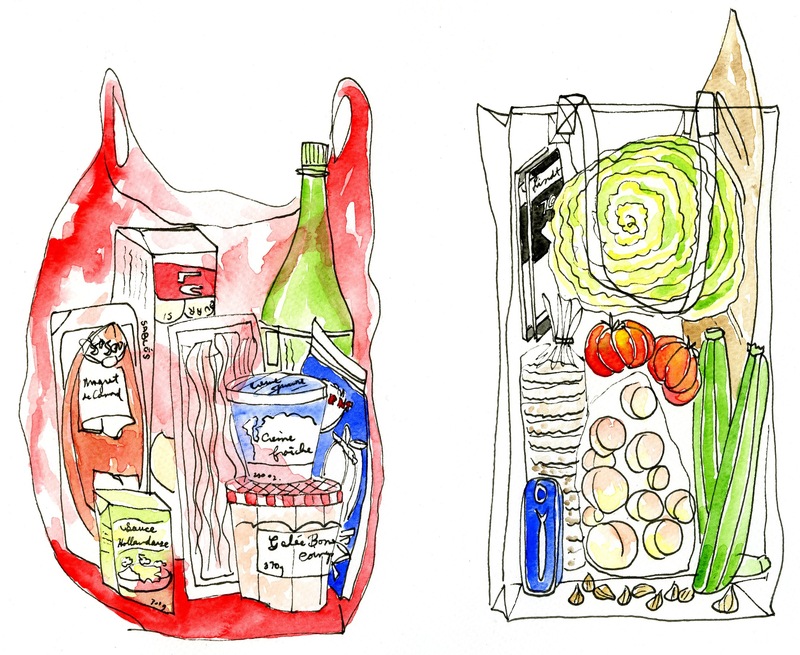 Hers: zucchini, nectarines, rice cakes, anchovies, lettuce, coeur de boeuf tomatoes, chocolate, baguette, shallots, reusable canvas bag. Although our eating preferences are not always compatible, together, we have the power to fill the fridge. Coeur de boeuf. Translation: beef heart. Literal translation: beefsteak tomato. Oh la vache! Translation: holy cow! 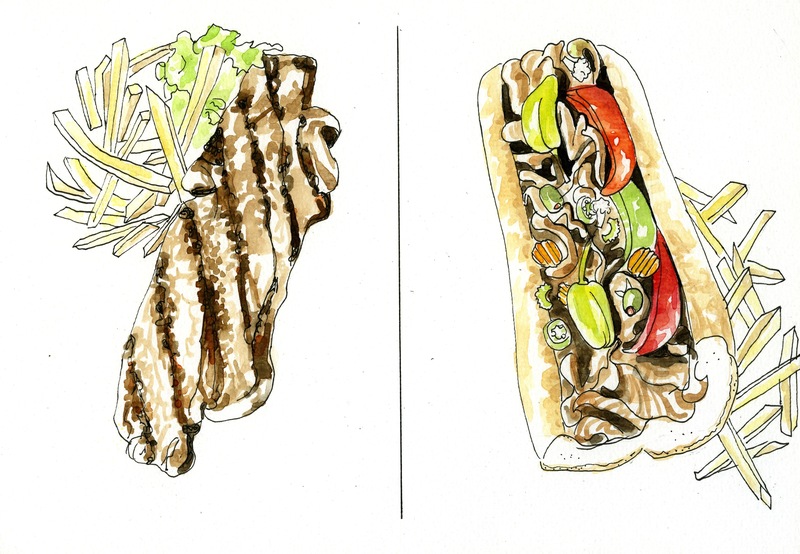 My mouth has never watered from the site of my own watercolor until I sketched out this Italian beef sandwich on the right, a true Chicago classic. 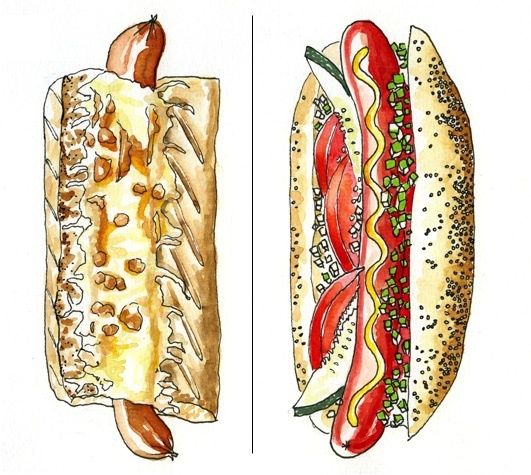 For those who have never tasted one, I am going to continue this self-torture by illustrating the elusive Italian beef sandwich further. Thinly shaved roast beef is soaked in its own rich, Italian-spiced broth for several hours. The beef is spooned onto a torpedo of mediocre Italian bread which is then baptized or “double-dipped” in the beef’s own juices. Topped off with sweet green and red peppers and giardiniera, the least-hip pickled vegetables you have ever seen. It is a soggy, old mess which can only be eaten alongside an obligatory order of french fries and a fully-loaded napkin dispenser. *By the way, do not forget to like my Facebook page. Or get up-to-the-minute musings on Twitter. Or share your favorite francofly images on Pinterest. Place your bets! 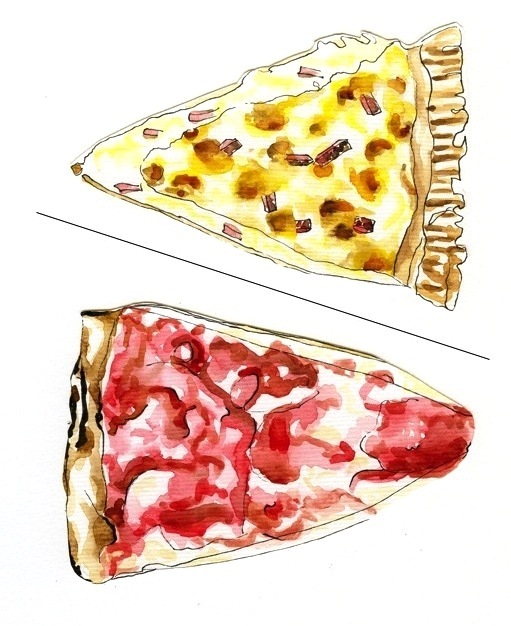 Voila, the quiche lorraine / deep-dish pizza throwdown. The first time I did the dutiful deed of making my then-boyfriend, now-mon mari a roasted chicken, I gave him first pick of its parts. “I like the wings and the skin.” I turned to him and smiled, “Perfect! That is exactly what I never eat!” Moments like these, I am reminded of what different places we come from. Chickens now have nothing but boneless breasts in the States. And I’ve been missing out on all the tasty bits. Nevertheless, it is my pleasure to present a new series on how very different something can be between Parigot & Chicago. First up, l’hot dog. In celebration of the 14th of July, we attended an apero on the 6th floor of an architect friend’s place in Belleville. It was younger crowd than usual. And every single one of them was an architect. But I was feeling confident. My outfit was banging and I brought fleur de sel brownies which always gives me a leg up on friend making. In America at least. It went on like any other apero. I bought myself some time at the buffet and put out my feelers, scanning the crowd for a little eye contact and resulting chitchat. No luck. Luckily, I became well-acquainted with a friendly couple named Tarama and Blini. But it was only a matter of time before the fireworks erupted far in the horizon. In the nick of time, “Firework”, Katy Perry’s fist-pumping anthem of self-esteem came on. 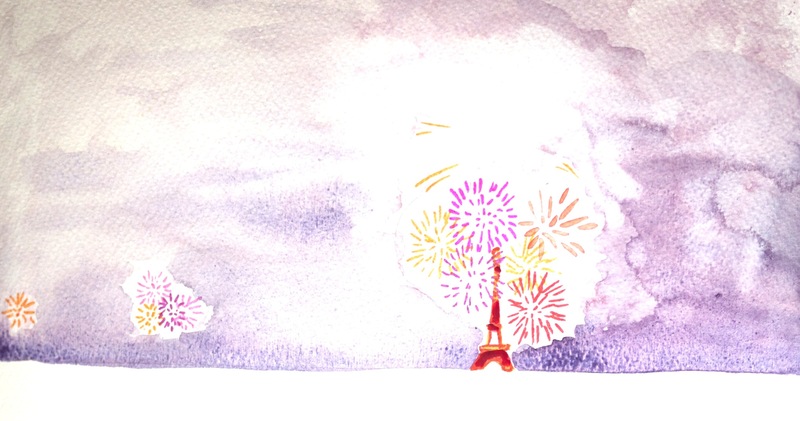 Her Swedish songwriters sure tugged on my cold heartstrings as I watched the Eiffel Tower blowup in the distance. Come on Jessie, just “ignite the light and let it shine!” “Boom boom boom!” You too can be brighter than the “moon moon moon!” I said to myself as I mussed up a little courage to confront the second half of the soiree. I refilled my drink. Seconds later, as the last firework fogged up the Parisian sky, Dionysis and the little-g party gods were with us as the whole flat erupted into a collective, full-throttle dance party. Damn, these architects could flail. They could even dance to Celine Dion. Somewhere between “No Diggity” and “Wannabe”, I became fast friends with a 20-year old Danish Erasmus student. She pulled me close as we were jumping around to House of Pain, “I have a question. How old are you?” “I’m 26.” ” You seem like you are finished with partying. Why aren’t you drinking?” At this point, I already drank a whole bottle of wine and dug deep into my 1990s subconscious to recite every word of Shaggy’s “Mr. Boombastic” by heart. How dare you tell me I’m not fun! 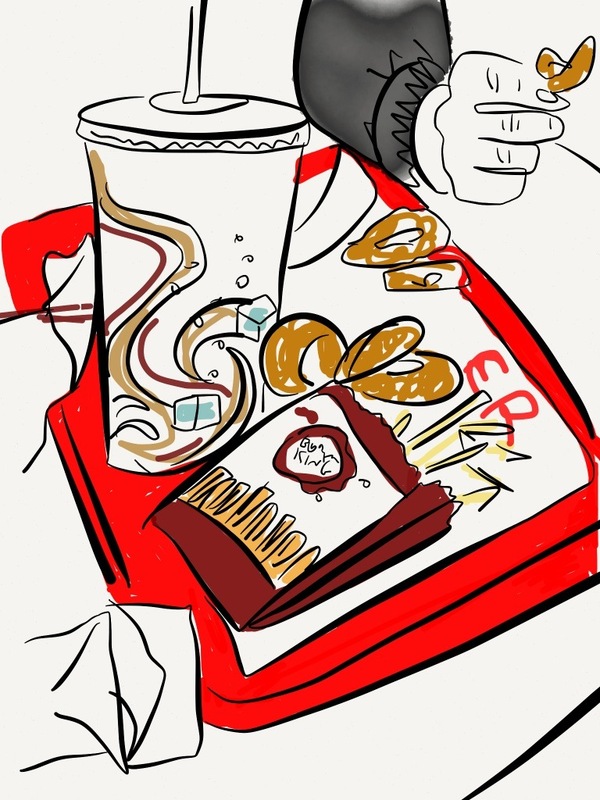 Yes, Joni Mitchell and collecting digestive teas can lead to an equally interesting evening. But those things are reserved strictly for Sunday nights. Defeated, my husband and I returned home. As my hangover carries onto its second day, I accept the fact that my idea of fun™ is not exactly the same as it was when I first arrived in Paris 4 years ago. But Shaggy will be with me for life. A ratatouille is a ratatouille is a ratatouille. 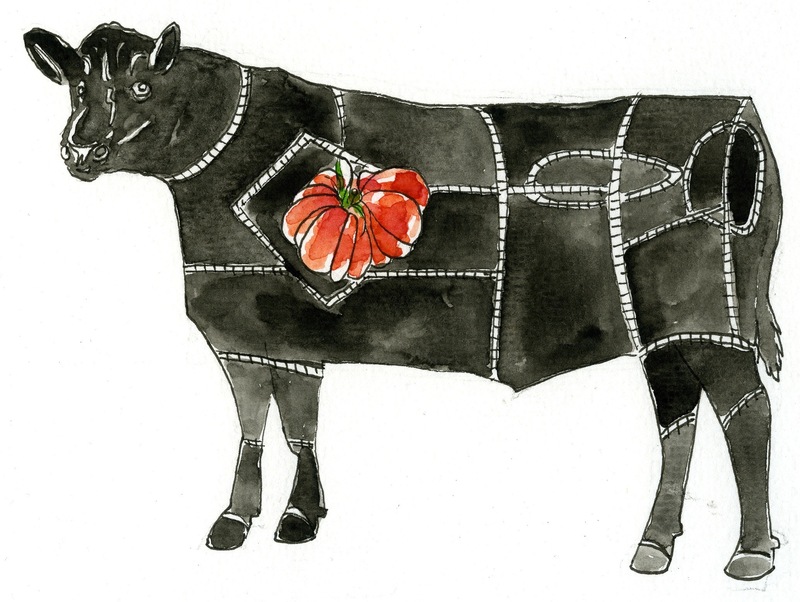 It all began with a Sunday roast, rather a rosbif (translation: ‘French’ for roast beef). Like always, mon mari was in charge of the roast and I was in charge of the accompaniment. Digging through the fridge, I exclaimed, “Hey! I’ve got all the makings of a ratatouille!” I’ve always thought that any combination of zucchini, eggplant, red peppers, tomatoes, onions and garlic would instantly qualify as a ratatouille, even disguised as a the quick saute. But mon mari is always discouraging me from making it. As Mr. Meat & Potatoes himself, I just shrugged it off as an unsuccessful attempt at force-feeding him something green. But finally, it came out, “c‘est pas terrible! A real ratatouille needs to be cooked for at least a day or two. It should be like jam when it is done”, he insisted. Was this just another cross-cultural, marital culinary scuff? Sure enough, in a country divided by 200-something kinds of cheese, the preparation of ratatouille has inspired a national debate, too. The ingredients can simply be sautéed. Or they can be layered and baked in the oven. Or simmered away for hours à la Joël Robuchon. I sucked up my pride and rescheduled the ratatouille, leaving it to stew away into the evening hours. Alas, Robuchon, I mean, my husband, was right. 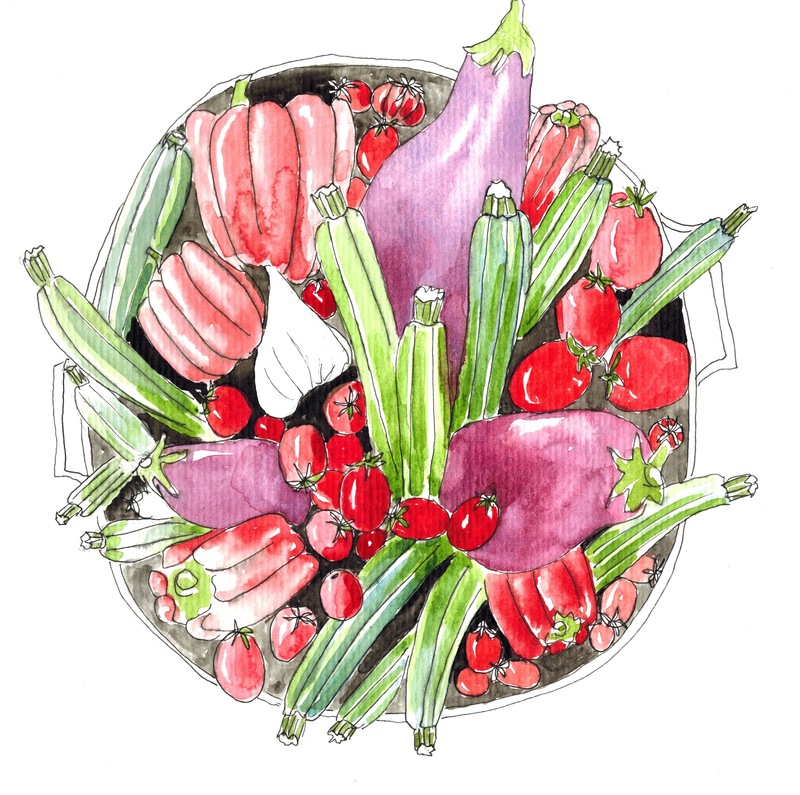 Although all the vibrant colors of the vegetables were lost in the stewing, what was left was a rich, meaty concentration of vegetables, leaving it with an intensely savory sauce evoking a boeuf bourguignon. I poached some eggs in the ratatouille and dinner was served. Although I will still use all three methods, all of them should be explored to come to a personal conclusion. But the simmering method upgrades ratatouille from an unconscious side dish to a sophisticated main course.